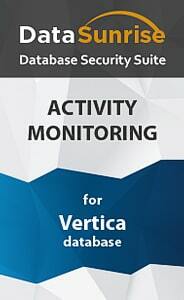 DataSunrise Database Activity Monitoring for Vertica brings to surface who accessed your database, why and when. Generating statistics allows you to keep a Vertica database under constant control. Information collected can be easily adapted for use in detecting suspicious user activity, revealing and investigating data leak thus ensuring reliable data security. Meeting the pressing security challenges will require right information at hand to be studied and analyzed to always keep your sensitive data protected. Client application (application name, host name). Learning mode memorizes typical database events and enables to generate alerts in case of unusual Vertica activity. By default activity monitoring results are saved in SQLite database integrated into DataSunrise. The information may also be optionally kept in other external databases provided by the software product. To get a more detailed analysis of deviations from standards and in order to obtain a more comprehensive understanding of Vertica activity, information generated by the monitoring tools can be exported to SIEM systems.